While there are bound to be plenty of fascinating stories that come from the 2012 WSOP, one of the most interesting has to be that of Ylon Schwartz. The New York City native recently earned his first career gold bracelet after winning the Event #27 $1,500 H.O.R.S.E. tournament along with $267,081. 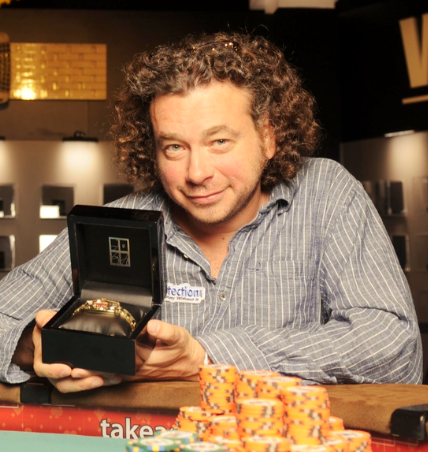 Of course, winning a bracelet is nothing new to the poker world because there’ll be 61 different bracelet winners when the 2012 WSOP concludes; what’s fascinating about Schwartz’s win isn’t the victory itself – but the path that he took to get to where he is today. Long before experiencing poker glory in Las Vegas, Ylon Schwartz spent most of his time in the parks of Manhattan. A self-confessed outsider, Schwartz became fascinated with the underground chess scene the city played host to. After winning his first $2 bet, the New Yorker was immediately hooked on hustling chess games. Schwartz became a profitable player and was even able to make a living off his passion. Unfortunately this living didn’t amount to much for long so he was constantly looking for other avenues of employment. This included a brief but unsuccessful college stint, odd jobs, backgammon, darts, and betting at New York City racetracks – none of which truly paid off. By the turn of the millennium, Schwartz’s inability to find steady employment left him homeless. But there was light at the end of the tunnel after a friend taught him how to play poker. After finding a home and a bankroll, Ylon began to play poker in underground Manhattan clubs. Despite his relative inexperience, Schwartz didn’t have much trouble in the beginning since he was able to make correlations between poker and chess. Now he still kept hustling chess and other games, but poker soon became his primary source of income. Eventually, all of this grinding paid off in a major way when he made a miraculous run in the 2008 Main Event and finished fourth place; this earned him a massive payday of $3,794,974. The $3.8 million windfall not only put Schwartz on the poker map, but also gave him the bankroll to play in more huge tournaments. Four years later and Ylon Schwartz has gone from strength to strength; now he has a WSOP gold bracelet to his name, and overall poker winnings of $4,624,754.